Not what you expect, and that's a good thing. When Glu Mobile made us aware of its newest impending iOS and Android release, Contract Killer Zombies 2 Origins, we expected another first person shooter reminiscent of the original effort, as well as the Contract Killer games. Surprisingly enough, it's a free-roaming third-person shooter that appears to have plenty of blood and weapons to spare. Contract Killer Zombies 2 Origins casts players as Evelyn, also known as Shooter's sidekick. Players guide her through the Safehaven Research Lab blasting undead monsters with a variety of guns and even a melee weapon. 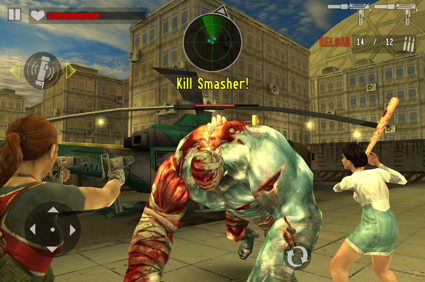 A Survival Mode lets users compete for high scores against waves of creatures, and a variety of mission types should help keep the campaign exciting. That said, we expect great things from this free title, and look forward to downloading it later this week. For now, check out the trailer and screens.